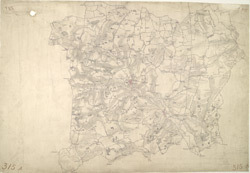 This is a plan of the Gipping Valley in Suffolk. The circular hole in the top left-hand margin indicates that an 'Ordnance Office Copy' blind stamp has been removed from the manuscript. The die has cut through the paper causing the stamp to fall out. Pencil rays intersect across the map, evidence of measurements taken by the surveyor between fixed triangulation points.